(CNN) President Donald Trump&apos;s sudden dismissal of Attorney General Jeff Sessions was a swift strike to exploit Washington&apos;s new power dynamics after the midterm elections. It represents a huge risk since Trump&apos;s ultimate aim seems to be to endanger special counsel Robert Mueller&apos;s Russia probe, and the move is almost certain to lead to an immediate investigation once the new Democratic House majority gathers in January. In a way, Wednesday was peak Trump, with the President making a transparent effort to change the narrative after the GOP&apos;s monopoly on Washington power crumbled on Tuesday. His canning of the former Alabama senator and the widened Republican Senate majority mean he can install whoever he likes at the Justice Department -- giving him effective control over the investigation into his own campaign&apos;s actions. "It&apos;s a break the glass moment," Democratic Sen. Richard Blumenthal of Connecticut told CNN&apos;s Kate Bolduan on Wednesday night. "Our democracy is under attack. It&apos;s a kind of a slow-motion &apos;Saturday Night Massacre,&apos; as occurred under President Nixon." Whitaker, who served Sessions at the Justice Department as his chief of staff, now has the power to oversee Mueller, who is seen as moving toward the end of his investigation. 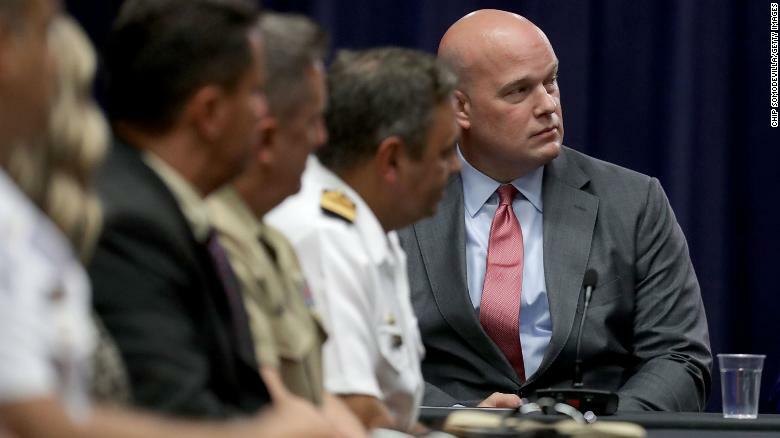 Whitaker could narrow the range of the special counsel&apos;s mandate or limit funds for his work. It&apos;s possible he could also control whether any final report is made public. And he could lay the groundwork to dismiss Mueller. Whitaker&apos;s elevation also wrested control of the Russia probe away from Deputy Attorney General Rod Rosenstein, who has shielded Mueller, and is viewed in Washington as a nonpolitical career official acting with integrity. It&apos;s not Trump&apos;s style to admit mistakes. So he turned the traditional grim post-midterms presidential news conference into a sideshow while waging a base-pleasing war on the press with a fulminating display at a post-election news conference. Not for Trump the gloom and self-recrimination of Presidents George W. Bush and Barack Obama when they bemoaned a midterm "thumpin&apos; " and a "shellacking." Rather than express guilt about lawmakers who lost their jobs, Trump openly bid good riddance to Republicans who had spurned his "embrace." It&apos;s not unusual for Cabinet officials to pay the price for their boss&apos;s failure at the polls. There was an ironic precedent to the toppling of Sessions. Twelve years ago, as Speaker-elect Nancy Pelosi was setting the terms for a new political alignment after winning the House -- just as she was Wednesday -- Bush forced out his defense secretary, Donald Rumsfeld. The President has every right to dismiss any of his Cabinet officials. But his open denunciations of the Mueller probe and months of attacks on the special counsel mean that Trump&apos;s critics are deeply skeptical of his motives. "You can&apos;t sound too many alarm bells about what has been going on," Preet Bharara, former US attorney for the Southern District of New York, said on CNN&apos;s "The Situation Room." From the outside, Trump&apos;s move against Sessions looked very much like the latest in a sequence of steps, starting with the firing of FBI chief James Comey last year, to undermine the Russia investigation. The President&apos;s move presented an immediate challenge to Pelosi, who he had praised earlier Wednesday for her likely return to the speaker&apos;s chair, and offered to open a new era of deal making between Washington power players. But as she also called for Whitaker to recuse himself, Pelosi knows, just like Trump, that there are two months before Democrats have the means to check the President&apos;s power. It could be that Trump is calculating that he has a window to do as much as he possibly can to stifle Mueller&apos;s room to maneuver, under the cover of the sympathetic outgoing Republican-led House and the GOP Senate. Still, the President&apos;s comment represented a warning that he would try to strong-arm the newly Trumpian Senate into following his will, much as he did to parts of the Republican-led House, including the Intelligence Committee.